There are MANY photographic spots in San Francisco, but below are some of my favorites. These are in no particular order. However, I tend to love to work through the city in a strategic plan. So I will take you on the route I usually do that makes a general loop through my favorite spots. Treasure Island is a perfect vantage point to shoot from across the bay the city skyline. It’s not that you will get the best Holiday Light images from here, but it is a great place to shoot and get yourself situated. It’s also a great place to park and then carpool if you are meeting others to go out and shoot the city and coming from various locations. Be warned though; do NOT leave ANY valuables or anything that looks like valuables in your vehicle. With that said, the area is safe, but break-ins are known to happen. Here you will find yourself right in the middle of all the action. It is busy so be sure to arrive early to get parking if going on a weekend or the Santa festival is taking place. Otherwise, it is impossible to park. 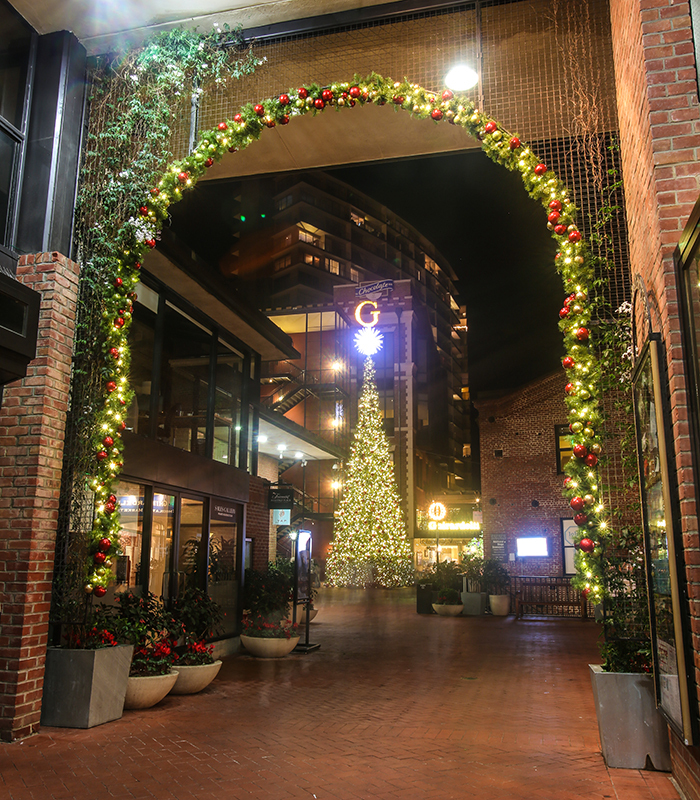 I love shooting here because the Holiday Spirit is in full swing. 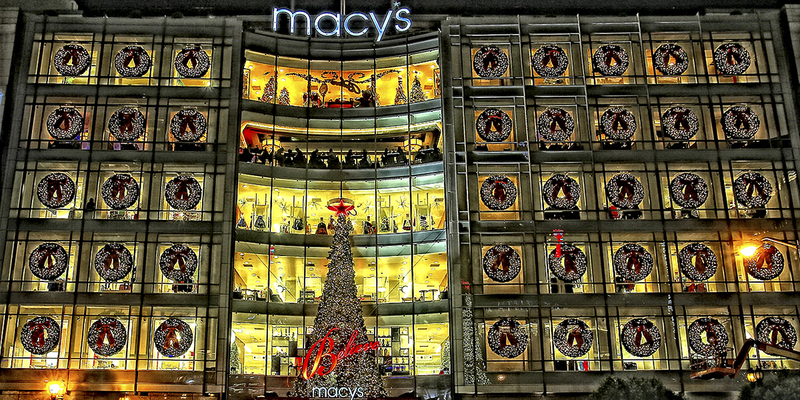 Everything from the outdoor ice skating rink, the drunken Santa’s and of course the Macys Christmas tree window display can be found. 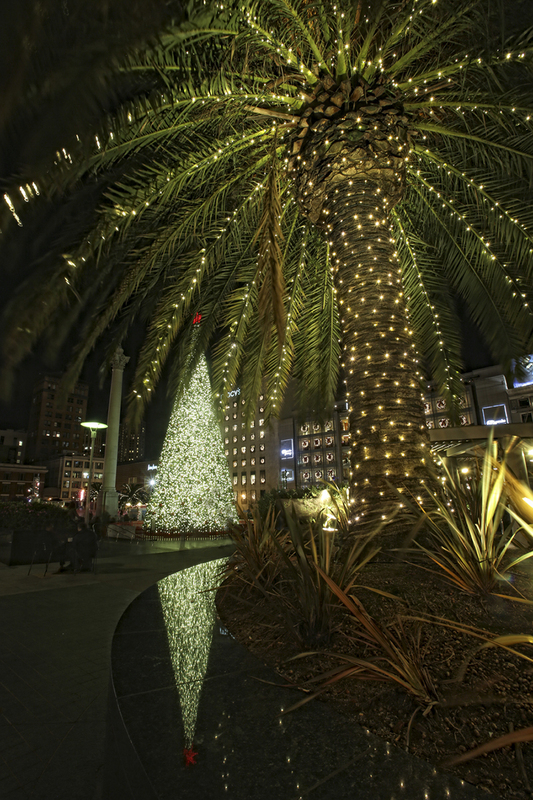 One particular tree worth photographing, are the palm trees that are lit quite nicely each year. Each year the city sets up an array of Holiday cheer in Red and Green. It is possible to get some very nice images of the building as well as the leading lines of the pathways that lead up to the steps. There are many photographic opportunities here and personally I love coming here during the holidays. 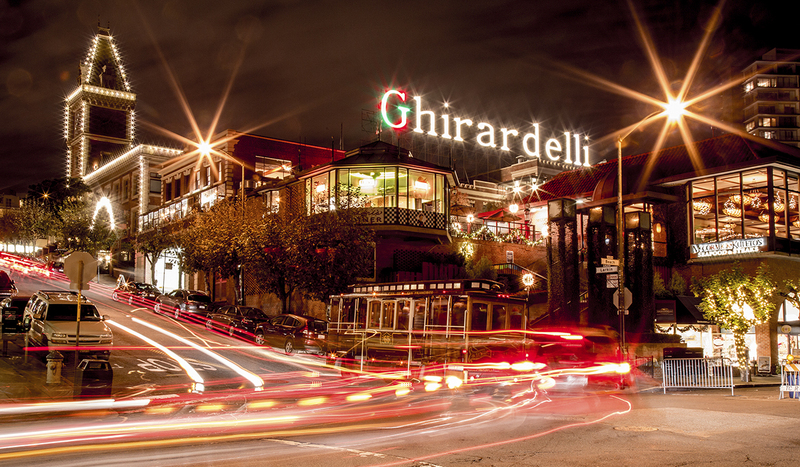 The famous Ghirardelli sign is lit up in special color for the holidays which makes an awesome shot from across the street. One of my favorite images to get here is the long exposure passing of vehicles and their lights streaking by. It makes for great visuals and below in the tips I explain how to do this. If you are lucky, you may get a Cable Car load of revelers on their way by adorned with colorful Christmas lights as well. This can really make your images unique! Do not be afraid of extra-long exposures to get these shots! Upstairs, make sure to photograph the fountain. It can be busy but if you start late enough, usually by the time you are here it’s not too bad. Long exposures of the red lit fountain can be beautiful. Next, walk on over to the large Christmas tree. One of my favorite things to take pictures of is reflections up close in the large golden ornaments. After this, a stop for a good hearty bowl of clam chowder and hot chocolate at Lori’s Diner should warm you up for the last part of our circle of favorite locations. I love to end the evening here. Usually, by the end of the night it is much quieter and a nice place to really create some spectacular photographic images of San Francisco and the city-scape. Many of the buildings of the skyline will have color lights on them. 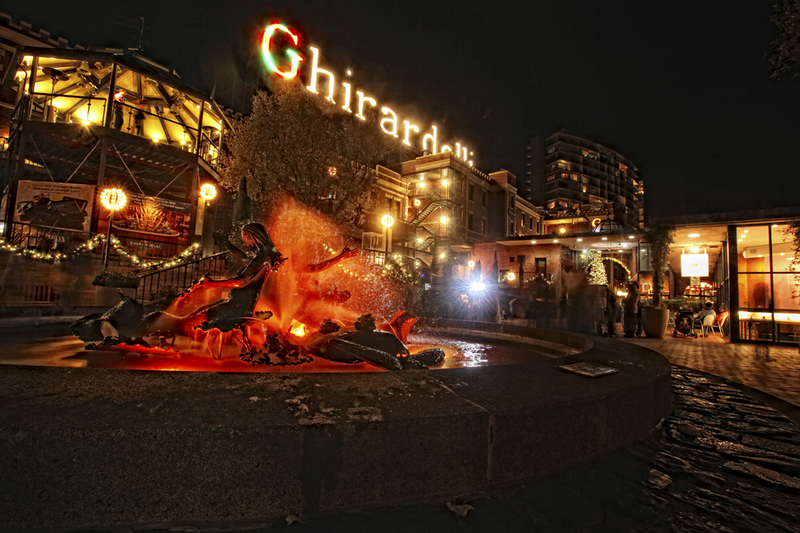 First, prior to going out on the pier, take a few images of the modern sculpture work all decked out ion holiday cheer! Next, go to the very end of the pier and shoot back towards the city. Don’t worry about the pedestrians in your images, they will hardly show up during a long exposure anyway. Use the leading lines of the walkway to lead your viewer to the city scape. Taking a low angle can create a sense of the walkway being right there for your viewer to “step into”. I love it when it has rained a bit here. Everything is so still and quiet and the walkways have a beauty of reflecting light. Look for puddles if it has rained to see what reflections you can come up with! 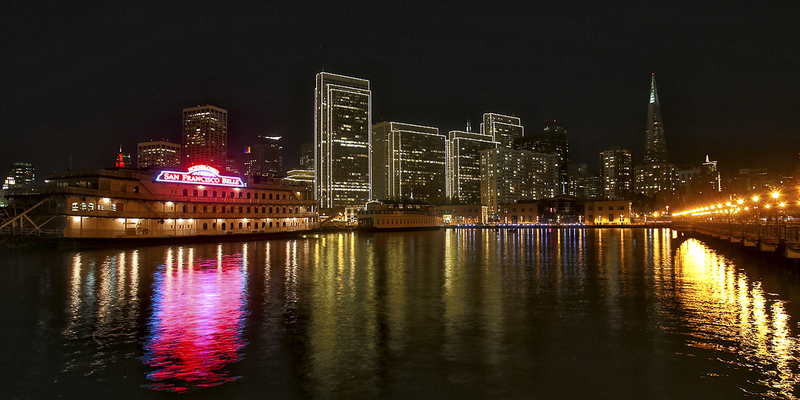 Last, I also love to shoot from Pier 24. 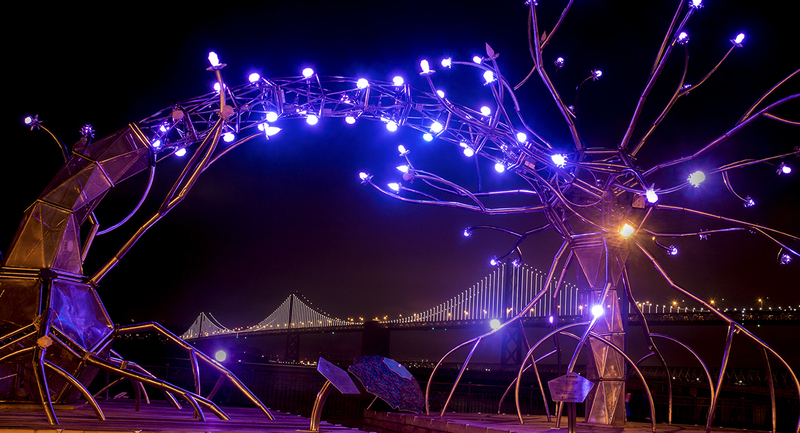 It is just a great location anytime of the year to shoot and get some great images of the bay bridge. 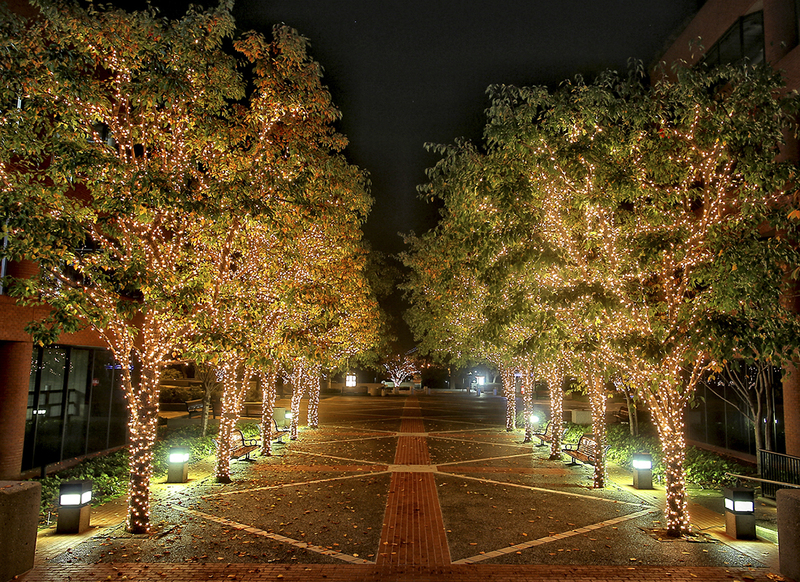 Check out our video on shooting holiday lights here. A good tripod is essential for this. A cheap one from the local electronic store will not work! Your images will only be as good as you can get your camera still. If there is ANY movement at all in your camera with the long exposures, your images will not be sharp. Be sure to understand how to use your tripod correctly prior to going out. It is much easier to learn how to use it in the comfort of your own home rather than out on a cold damp night in the city! Make sure everything stays secure while working with a tripod or otherwise; you may find yourself with a broken camera and asking Santa for a new one! Check out our video on tripods here. As this will require more light to make your exposure, you will find that you need to open up your Aperture/F-Stop to the smallest number (largest opening) your lens will allow. The more expensive the lens, the more ability you will have to go to a smaller number such as F2.8 as an example. Most standard lenses will only go to about F3.5 or 5.6. Next, adjust your shutter speed according to your light meter in your camera. Since you will be working in low light conditions and also using an ISO that requires more light to expose the sensor, you will find that many of your exposures will be very long. Do not be worried about long exposures that may be 10 or 15 seconds or even longer! That is why we have the tripod. Simply adjust your shutter speed to the length of time needed to create a well-lit image! See this video on exposure. If you do not have a cable release, that’s ok. You can simply set your self- timer on your camera for 2 seconds. The key here is to make sure you are “hands off” when the shutter goes. While depressing the shutter, vibration from your hand will cause the image to be shaky. It’s the little things that count sometimes and this little item can make or break your holiday images! 4. Get creative in composition! Work with many different angles and compositional techniques. Do not just set up and shoot horizontal eye level! That is what EVERYONE sees on a normal basis. The trick is to get your viewer to see a perspective they would not normally see. In doing this, you create something different for their eye which can translate to more impact in your photographs! 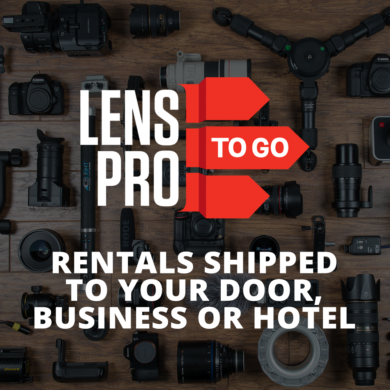 Be sure to try all the various lenses in your bag. Personally, I love shooting with a wide angle lens. I work with it so it feels as if my viewer is taking a “journey” through my image. By allowing the viewer to see angles and lines that “lead” into your main subject matter, it’s as if the viewer can step into the photograph and walk through it. A larger number with your Aperture creates a smaller opening inside the lens for light to enter. Usually, with low light we tend to need a small number as mentioned above. However, by doing this and taking light away entering through the lens, we can compensate by allowing our shutter to stay open even longer (30 seconds as an example) and as vehicles or lights pass by, they will become streaked with their motion. This can have added effect to all of your images. 8. Have fun and don’t be a scrooge! Isn’t that the point!? Have a great time and enjoy the journey and the Holidays! Here is another video for you to check out on how to photograph Holiday Lights very clearly explained as well as how to do it with people in your images such as your kids in front of the tree or fire place. From myself as well as Ally and all of us here at MPA, have an AMAZING Holiday Season and Happy New Year!